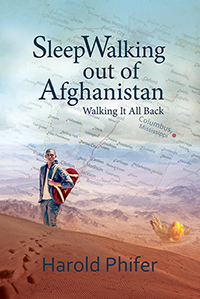 Author Harold Phifer is taking his latest book Sleep Walking Out of Afghanistan: Walking It All Back, on tour — a Virtual Book Tour with Outskirts Press. This will allow Harold to take his book into the far corners of the globe, all from the comfort of his own home! Keep an eye out for Harold’s book as he will be featured on several blogs over the weeks and months ahead! Luckily for us, Harold was kind enough to answer a few questions as the tour was getting started so that we can give you a sneak peek into the mind of the creator of Sleep Walking Out of Afghanistan: Walking it All Back. OP: Tell us a little bit about Sleep Walking Out of Afghanistan: Walking it All Back. What is it about? Harold: Fighting for survival from a car bombing in Afghanistan yet finding the peace that had eluded him in the process. Harold: During my most frightening moment I promised myself that I would write this story if I survived that Taliban attack. Harold: I self-published through Outskirts Press. Harold: Readers that like survival stories; readers that have dealt with bullies; readers that are from dysfunctional households; readers that have dealt with schizophrenia; readers that have love for a father; readers that love comedy/humor; readers that loves a feel good/inspirational story. Harold: It’s a combination of Terror, Disgust, Innate Love, Inspiration, and Humor. Harold: Most people can identify with at least one of the characters or events in the book. Harold: This is my first book. Harold: I do plan a follow-up book. OP: Thanks for your time, Harold! We look forward to learning more about you as you visit other bloggers! Harold Phifer was born and raised in Columbus, Mississippi. All of his first 25 years were solidly spent inside his home state. After graduating from Mississippi State University and Jackson State University he went on to work for the Federal Aviation Administration (FAA) for 23 years as an Air Traffic Controller. He eventually left the FAA and began work as an international contractor where he has done numerous tours in Iraq and Afghanistan.